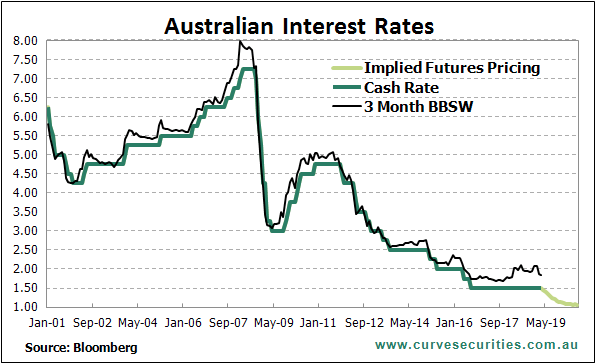 The RBA left the cash rate on hold again in April making 32 straight months that the cash rate has been at 1.50%. Global growth concerns continue to intensify. These concerns are starting to impact the outlook for monetary policy in a number of jurisdictions. The RBA continues to make subtle shifts to their current assessment of both the global backdrop and domestic outlook which could have implications for monetary policy. The RBA left the cash rate on hold again in April, marking 32 months the cash rate has remained at 1.50%. Risks to the outlook still remain evenly balanced with the key to the outlook still revolving around the employment market. A cut by year end remains fully priced in by the market with a follow up cut in 2020 still widely expected. History as a guide suggests that if the RBA were to cut rates they would follow up with a second within the next quarter. BBSW has continued to slide over the past month, reflective not only of the shifting expectations around the cash rate but also the reduced demand for funding from the major banks as their new lending activity slows. Ever since the fourth quarter GDP outcome was released in late February, the focus has been squarely on the domestic data and what it means for the outlook. The RBA’s shift towards an increasingly neutral bias with a more balanced outlook has no doubt played a role in the increased focus on domestic outcomes. That doesn’t mean that what is happening on the global stage should be ignored. It wasn’t that long ago that RBA Governor Lowe suggested there was risk of an economic shock that more likely would come from offshore rather than domestically. The key risks to the outlook have been known for some time. The trade war between the US and China has been one of the central themes when it comes to risks to the global economy. While there has been a lot of noise around a deal between the two nations being imminent, we are yet to see it. While the negotiations continue, the impact it is having on global activity continues to play out. Trade activity across Asia has been impacted particularly hard. Exports across Asia have been falling heavily so far in 2019 with export centric economies such as Japan and South Korea suffering large declines. More importantly for Australia has been China’s trade performance, and they have been the hardest hit. In February, Chinese exports were down 38%. While some of this is down to the timing of the lunar new year, the annual pace of export growth dropping from 9.3% to -20.5% speaks to the magnitude of the decline. Impacts are also being felt further down the value chain. Germany, who has traditionally been a value add economy where intermediate goods are imported and used to create final goods, such as motor vehicles and high end appliances, have seen factory orders collapse so far in 2019. Back to back sharp falls in January and February have seen orders compared to a year ago fall 8.4%. The slowdown in global activity indicators has been significant enough to draw the attention of a number of central banks. We saw the ECB started to walk back from aspirations of lifting their benchmark interest rate at the start of the year as the outlook started to turn. It is also one of the key drivers behind the US Federal Reserve’s decision to sit back and take stock of the current outlook rather than pressing on with further rate hikes. The deterioration in the global outlook was enough to warrant a significant change in stance from the Reserve Bank of New Zealand when they met last month. After leaving the cash rate on hold, the RBNZ said “given the weaker global economic outlook and reduced momentum in domestic spending, the more likely direction of our next OCR move is down.” Only six weeks earlier the RBNZ said that “The direction of our next OCR move could be up or down”, much like our own Reserve Bank. It is a timely reminder that small open economies, such as Australia and New Zealand, are heavily impacted with what happens in the global economy and it is something that needs to be closely watched. 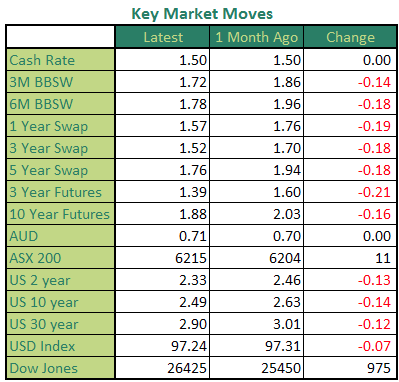 With the RBA already moving to a more balance outlook, where there are cases to be made for both higher and lower rates over the medium term, there was unlikely to be any further major changes over the past month. 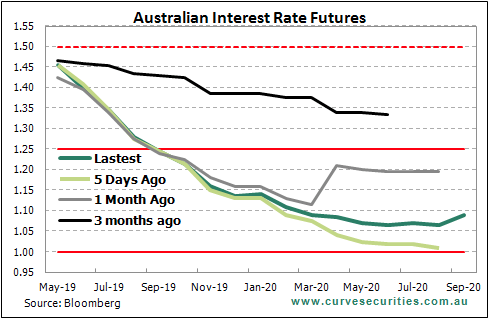 The cash rate was once again left on hold at the April meeting with the focus on the usual subtle shift in language used in the accompanying statement. The statement continued to point to the risks to the outlook while contrasting those risks with the ongoing strength in the labour force. The overall tone appeared a little softer but not a great deal. Many were quick to point out that a change like this is usually a precursor to a large shift in the RBA’s outlook. The latest inflation data due prior to the next RBA meeting and the latest forecast due in the quarterly Statement on Monetary will follow on the Friday. So the shift in the sentence could well be the RBA setting the scene for a shift to an outright easing bias at its May meeting. Given the RBA’s current balanced outlook and the fact its preferred forward leading indicator of employment continues to support their outlook, I suspect the shift in the final sentence is more a reflection of the more balanced outlook as compared to the old final sentence. Time will tell but until then, the focus will remain on the domestic data and how the incoming data alters the outlook for the economy and in turn monetary policy. Growth disappointed again in the fourth quarter with the economy only expanding by 0.2%. 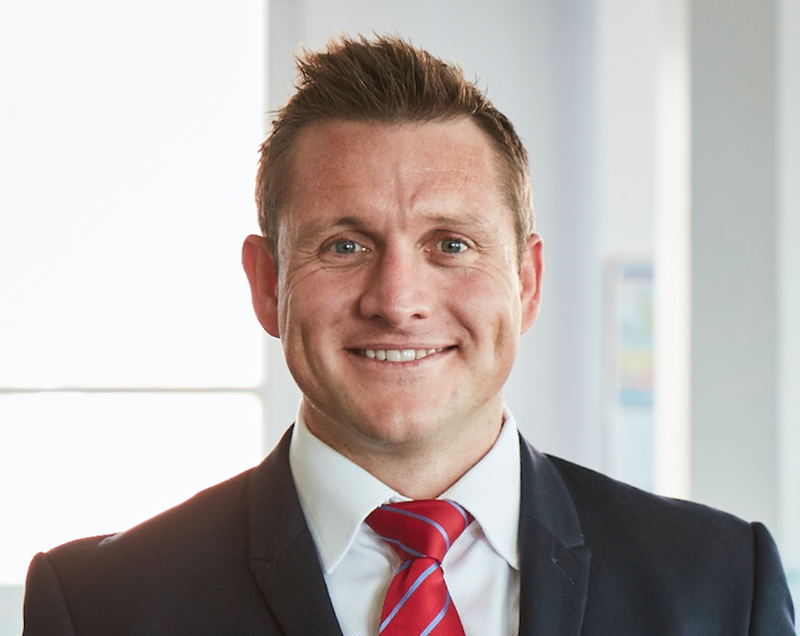 Annualised growth over the second half of 2018 was 1% compared to almost 4% in the first half of the year. The employment data was mixed in February with total jobs growth slowing to 4,600 for the month. Despite the slower month, the unemployment rate actually fell from 5% to 4.9% after the participation rate also fell 0.1%. 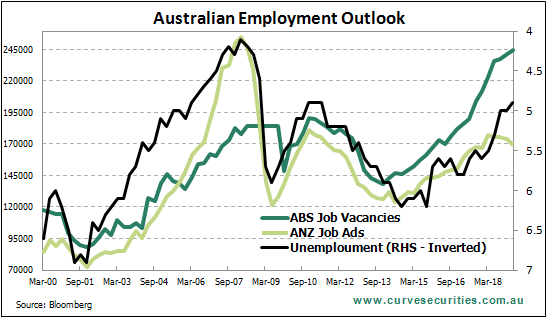 The ANZ job ads continue to point to a slowdown in employment growth with another sizeable 1.7% fall in March; however, ANZ does note the vacancy data and jobs ads have been diverging for some time which they suggest is due to a structural shift in how companies advertise for jobs. Business confidence continued to ease in March with the index dipping from 2 to 0 as uncertainty over the outlook continues to grow. The fall comes despite business conditions rebounding from 4 to 7. The employment index, while below the solid levels of 2018, still points to reasonable jobs growth over the months ahead. After rebounding in February, Consumer confidence fell heavily in March with the 4.8% decline taking the index below the key 100 level once again. Prospects of an interest rate cut helped boost confidence the prior month before the weaker than expected growth number and what it means for the outlook undermined consumer confidence. After a dismal holiday season, Retail sales recovered somewhat, bouncing 0.8% in February. While the gains were largely broad based, food retailing was the biggest contributor suggesting caution should be taken when extrapolating the result as a sign of renewed consumer activity. The downward trend in housing finance remains firmly in place. Both owner occupier and investor loans fell heavily in January. Further house price declines suggest new credit generation remains weak so far in 2019. Australia recorded its largest trade surplus on record in February thanks to a small rise in exports and falling imports. Rising commodity prices continue to lift the value of exports while softer domestic demand is reflected in the weakness in import values. Building approvals surged in February, posting a remarkable 19.1% increase in total approvals. The gains were driven by an unexpectedly large number of apartment approvals in NSW and QLD. Despite the bounce, total approvals are still down 12.5% over the past 12 months.